To add a new map, just unzip the files to your dominions2/maps directory (where all other .map files can be found). Instructions for Mac OS X users: Control-click on on your dominions application, select "Show Package Contents", and open up the resources folder. Then move the map data files from each individual downloaded map folder into the the resources/maps folder. Feel free to draw your own maps and send them to us at info@illwinter.com. 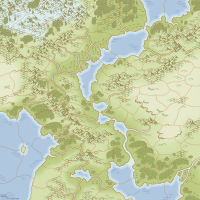 Additional maps including the forgotten realms Faerun map can be found at Arryn's Dominions Page. A site with downoads and player stuff. http://www.dominions-2.org. A familiar world. This map is very large. There are two versions. One ordinary and one 17 player scenario. Download map: world.zip. 31 meg. Right-click on link to download fixed world.map: world.map. Right-click on link to download fixed worldwar.map: worldwar.map. Fix 15 feb: Niefelgiant in Thule gets 2 water to enable commanding winter wolves. Neighbors 58-79, 265-268 removed. Scenario: World War. Version 2.05 needed unless mapfile is edited to remove some Marignon units. All seventeen nations on the world map. Each nation begins with four or five provinces and two forts at different locations. Abysia - Sahara & Arabia. Atlantis - Atlantic Ocean & Indian Ocean. Pythium - Byzantium & Ethiopia. Man - England & american east coast. Ulm - Bohemia & Estonia. C'tis - Egypt & Angkor. Arcoscephale - Persia & Indus. Caelum - Himalaya & north west rocky mountains. Ermor - South Italy & Namib Desert (undead force). Marignon - Spain & east Brazil (version 2.05 conquerors of the sea theme recommended). Pangaea - Russia & Amazonas. Vanheim - Norway & Newfoundland. Jotunheim - Siberia & west Greenland. R'lyeh - Pacific Ocean & Polynesia. Mictlan - Mexico & The Andes. T'ien Ch'i - China & asian steppes. Machaka - south central Africa & south Australia. 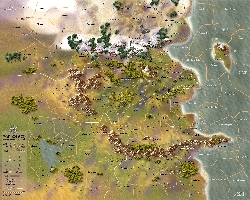 As I really like the general Orania War setup, and especially the map, but despair because the AI nearly always loses to me in the magical site race, I have decided to write a new scenario based solidly on the old one but with each nation given certain initial advantages in the forms of sites or extra leaders, sometimes in line with their default theme, sometimes giving a unique boost for the hell of it. Independents have also been set to 9. In general, it seems that the AI performs better vs. humans at higher independent settings - possibly because rapid expansion as a human the first dozen turns is a bit harder. Version of the world map created by Torvak. This map will replace the former one and uses the same .map file, so make a backup of the original if you want to keep it. It's now an uncompressed tga to avoid lockups (or what seemed like lockups) on slower computers. 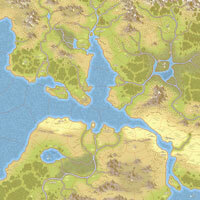 Ascension Games is posting a Northwest Middle-earth map for Dominions II made by Andrew Patzwald, 03/19/04. Map artwork taken from Iron Crown Enterprises "Northwestern Middle-earth Gazetteer"
Provinces are either named after the political states they cover (within the kingdoms of Arnor and Gondor for instance) or after major land features within their borders (Mirkwood, Rohovanion, Enedhwaith, etc.). Unfortunately, there is very little lore for the far eastern reaches of NW Middle-earth, so I was forced to use some artistic license. ;) Generally, if I had a province that had names in different tongues, I favored the 'common' (English) version. A beautiful map created by Jason Lutes. 221 provinces, 22 of which are water. CITIES: Settlement icons on the map are for flavor only, with the exception of the largest, which are Cities; A Province with a City in it always counts as Large. PORTS: A Province containing a Port icon (anchor) next to it is considered a Port; one or more Ports adjoining the same Sea Province are considered adjacent for movement purposes. FARMLAND: Provinces containing Farmland are indicated by small yellow crop field icons. MAGIC SITES: Magic Site distribution is per usual, with the exception of Provinces containing a white starburst icon; these Provinces are sources of power and have a higher chance of having multiple Magic Sites. RIVERS: Rivers are considered impassable unless they are shallow enough to be forded (indicated by a dashed red border line), or are crossed by a Bridge icon. MOUNTAINS: Mountain borders are considered impassable. STARTING PROVINCES: Players will not be started in Wasteland, Swamp, Magic Site, or City Provinces; all starting Provinces will have a minimum of four adjacent Provinces. Download map with fixed map file: cradle.zip. Download fixed map file: cradle_fixmap.zip. PhilD has discovered some additional bugs in the "fixed" version. Some underwater provinces that are adjacent to no other underwater, but are not marked "no start". He fixed that, and added a "rule" that a starting land province must have at least 3 land neighbours, and a starting sea province must have 2 sea neighbours (in addition to the 4 overal neighbours). Download PhilD's fixed map file: Cradle2.zip. Parganos. A beautiful map created by Jason Lutes. 135 provinces, 19 sea provinces. Download fixed map file: parganos_fixmap.zip. Parganos remade by Ironhawk. It will replace the original, so make a backup if you wish to keep the old one. A beautiful french map created by Robin le Guetteur. 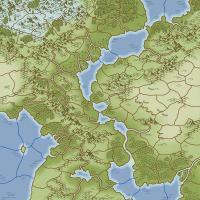 The map is based on the the lands of Tyrande in the world of Hannoerth created by Kern Ridenow. Find out more about Hannoerth at http://www.chez.com/pgz/ Expect more scenarios and mods from Robin in the future. There are two .map files in the zip. One with set start locations and one with random start. The zip also contains a tyrande_readme.txt that explains the map icons. Aux frontieres de Tyrande, les convoitises s'exacerbent pour s'emparer des terres parmi les plus riches du continent. Qui deviendra le monarque absolu de ce futur royaume ? - swamps indicate the presence in the province of that kind of element. A nice map created by Sandra. It is called "Land of Shahrivar" and is a sort of oriental fantasy world, with lots of details. The map has 180 provinces, with a little sea, but does not allow sea-players. Shahrivar is a month of the persian calendar, that ends summer and opens autumn. Its name means "Tempting Territory". The nations must fight to control famous magic sites and VP. Another file allows to play freely. A map created by Herve. It is a map with 89 provinces , for 2-6 players . A beautiful map created by Crandaeolon. This map is intended to be used with victory points. Each of the 14 start locations is worth one point, regardless of the actual amount of players. There are 6 neutral VP provinces, one of which is worth two points; that is 21 points altogether. The neutral VP locations have a pre-built fortification. I suggest setting the victory limit to 11 points. If you select some other victory condition, the points will have no effect. Three hundred years after the great cataclysm of the 'Burning Times,' life once again starts to flourish in the realm of Io. The water is tainted, turned to lava and blood. The forests are gone, and much of the land is scorched waste. Food grows in rare fields of Flesh Trees. Map created by Sergio Gonzalez. For 4-6 players. 133 provinces, 0 of which are water. Kingdom of Karan. 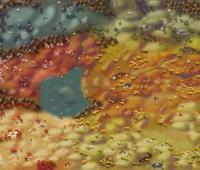 A beautiful map created by Targa. 162 provinces, 20 sea provinces. Defaultmapzoom was not 1.5 in the first version. Download fixed defaultmapzoomed karan.map. 41 provinces, 5 sea provinces. Two players. No sea races allowed. 69 provinces, 13 sea provinces. 39 provinces suitable for 2 players. Land only, no sea races allowed. The starting locations never change. Many craggy cliffs limit sea access. Ideal for 4-7 players, including both water nations. A light has come to the abyss in which the dead gods are trapped. For a thousandth of a second an instability ripples through the ether as a new world comes into existence. You do not hesitate, but pour yourself through the weakness and into the lands of the living. Right-click on link to download: theater.zip. 169 provinces, 23 of them sea. Ships are easily aquired and the sea is less of a barrier than one may think Right-click on link to download: seasky.zip. For those of you who do not use broad band there is also a smaller version of the map available. Right-click on link to download: miirunst.zip. 106 land provinces and 2 seas. Right-click on link to download: ringworld.zip. Right-click on link to download: valhalla.zip. Number of provinces: 85, 16 underwater. Number of provinces: 43, 11 underwater. Number of provinces: 19, no water. An US map made by Scott Anderson mostly for test games. Number of provinces: 48 ?! No sea provinces. A new US map made by Pronell Mordini. Suitable for a handful of players. 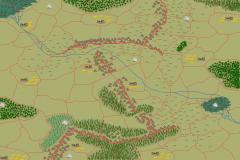 Lars M. Nielsen has made an english version of the Sundering map. This scenario was created by Alex Poger. It is demofriendly and uses the Desert Eye map. The seven nations of the demo begins at preset starting locations with several provinces each.